Note: Ships by Freight for $175.00 to any destination in mainland USA, but no lift-gate or inside delivery without special quote. SELECT “FREIGHT” AS SHIPPING METHOD WHEN CHECKING OUT. This is for orders of single products only. Please call for freight quote on multiple orders to same address. 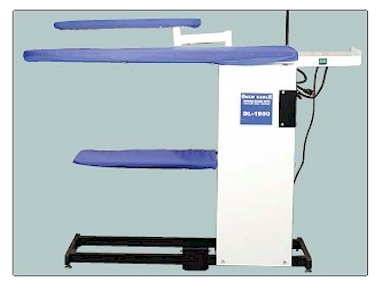 Our DL-1900 Ironing Board has a strong vacuum and heated surface. It assures a dry finish and quick pressing time. The strong iron support shelf can hold a gravity feed iron or a mini boiler. The support pole for the bottle or hoses is included. Ironing Board cover, pad and garment rack cover are of excellent quality.